John Hayes is the gargantuan Irish tight-head known by fans as 'The Bull'. A constant in the Irish front row for a decade, he was a world-renowned scrummager and a fierce physical presence in the loose. Hayes was a latecomer to rugby union, and it was not until the age of 18 that he turned out for Shannon in the second row. It was during a two year stint in Invercargill, New Zealand that Hayes was asked to fill in at loose-head while playing on weekends for Marist RFC. Upon his return to Ireland Hayes slotted into the Shannon front row and was soon packing down in the colours of Munster. 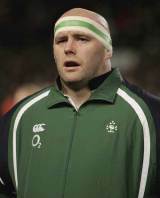 Hayes was deemed too green to travel with Ireland to the 1999 World Cup, but found his way into the side the following season. Hayes would go on to form the bedrock of the Ireland pack alongside inspirational captain Keith Wood and fellow prop Reggie Corrigan. The front row travelled to Australia for the 2003 World Cup, where Hayes' scrummaging power was played up ahead of the clash with France in the quarter finals. Hayes was unable to halt the French advance as Ireland were beaten 43-21. In 2004, Hayes was a member of the Irish side that recorded their first Triple Crown in 19 years. Success at international level was beginning to appear for Hayes, and Ireland would record two further Triple Crowns in 2006 and 2007. Also in 2006, Hayes was a member of the Munster side that finally ended the club's Heineken Cup drought in beating Biarritz in an emotional game at Cardiff's Millennium Stadium. Hayes was again part of the Irish squad at the World Cup in 2007, but their ignominious exit at the group stages could become an unfitting farewell for Hayes at the tournament. In 2008, Hayes again tasted glory with Munster, as they defeated Toulouse in Cardiff to lift the Heineken Cup for the second time. He became his country's most capped player during Ireland's historic Six Nations season in 2009 that ended with their first Grand Slam in 61 years. Hayes was later drafted into the British & Irish Lions squad that toured South Africa as a replacement for the injured Euan Murray and featured in the third Test victory over the Springboks at Ellis Park. Later the same year, Hayes received his first red card for stamping on Leinster prop and Ireland team-mate Cian Healy. He was handed a six-week suspension for the offence that was later reduced by seven days - clearing him for Ireland's end of year campaign. He won his 100th Test cap against Italy in the first match of the 2010 Six Nations and became the first player to rack up a century of appearances for Ireland against England the same month. Hayes intended to retire from competitive rugby after playing his part in Munster's Grand Final victory over Leinster in the summer of 2011 but he signed a short-term deal with the province in order to provide front-row cover during the World Cup later that year. However, he finally brought the curtain down on his illustrious playing career on December 26, 'The Bull' receiving a hero's send-off as he was replaced with 20 minutes to go in Munster's RaboDirect PRO12 win over Connacht.